Property rights abandoned for populism? "We would be most disappointed if politicians were to encroach upon private property rights." Sounds exactly like the sort of thing an ACT member would say. Or an ACT MP. It is in fact the Chairman of Te Runanga O Ngai Tahu responding to ACT Leader, Rodney Hide, who has described their plans to levy fishermen on Lake Ellesmere as "appalling" and setting a bad precedent. This I just cannot get my head around. Ngai Tahu own the lakebed just as Tuwharetoa own the lakebed of Taupo and have long received recompense from permits to fish. It's user-pays in operation. The proposed fee, 8 percent, will go towards protection and restoration of the lake which Ngai Tahu currently pays $170,000 towards. I am not even going to link to the many instances of ACT MPs, past and present, staunchly defending private property rights. It appears that the way Ngai Tahu has gone about imposing the fee has left a lot to be desired and I can understand the anger of long-time commercial fishers. Also there seems to be an ethical problem in that Ngai Tahu apparently assured users at the time of settlement they would not be 'impacted'. If these are the aspects Rodney is objecting to he has a point. But again we come back to the heart of the matter. The principle. Are property rights only for some? High country farmers for instance? The latest Ministry of Social Development magazine has a feature about marae justice. While I am all for trying new ways to get youth offenders back on track the process that goes on at a Gisborne marae, serving as a youth court, seems to employ an awful lot of resources. ....That coming together of many agencies and individuals is why with only two offenders before the court today, there is still a gathering of twenty or so people as the powhiri begins and the group makes their way on to the marae. Once inside, kaumatua and the Judge stand and korero, both in Maori and in English. .... Everyone involved cares about the young people. Lay advocates take the time to get to know the young person and their whakapapa and relay that information back to the kaumatua. After the powhiri, korero and a waiata, the court breaks for a cup of tea and there is again opportunity for connection, for talking, for sharing. ... offender stands to leave. She’s been dismissed because since her family group conference she has reoffended, and that means she’s being sent back to the Youth Court held in Gisborne’s District Court. The irony is the family group conference process was was also created in an attempt to embrace Maori Tikanga. Yet FGCs give youth the message there are few if any consequences of their offending. They have been used for nearly 20 years yet youth offending remains intractable. In another 20 years I fear I will be writing the same about marae justice. Ex-Nat, ex-NZ1ster, now Mayor of Wanganui Michael Laws' plan to ban gang patches has hit a hitch but new MP Chester Borrows and the National Party are supporting a Bill to make the wearing of gang patches illegal but only in Wanganui. Commonsense is a wonderful guide to sound law making! The move to outlaw gangs, their patches and tattoos is nothing more than a ploy to give the appearance of action - a ploy that will yield no results or benefit to New Zealand society in the long-term struggle to deal with the country's gang problem, ACT Deputy Leader and National Security Spokesman Heather Roy said today. "Such moves are wrongly-focussed, token-ist and entirely predictable - hard-line policies to deal with gangs are reeled out by different Parties in the run up to every election," Mrs Roy said. "Clearly none of these 'flash in a pan' policies have worked - because they focus more on addressing the mayhem that individual gang members cause, rather than on initiatives that will hit gangs hardest and make it harder for them to operate. "Legislation outlawing gangs and their insignia is just more law - we don't need more laws, we need to enforce the ones we already have and give police the power to tackle lawlessness where and when it happens. "Gangs' impact on society is more about their actions than their visibility. Rather than worrying about what gangs wear, we should establish a special IRD unit to audit their incomes and hit them where it hurts the most - in their wallets, rather than their wardrobes. Forget about banning gang patches. We need to focus on the anti-social behaviour that they represent. We already have plenty of laws to deal with that but, as a society, we appear to lack the will to enforce them. That's why the criminals are getting bolder. The proposal to have gang patches banned in Wanganui now looks certain to pass into law. MPs have voted 64 to 58 in favour of the Gang Insignia Bill. Labour, which originally supported the idea, backed down and opposed it, however National received the support of ACT to allow the Gang Insignia Bill to pass through. The law would prohibit gang members wearing any patches on the streets of Wanganui. The bill has two final readings before it comes into effect. Green MP Metiria Turei is among those to oppose the plan, saying it will not stop gang violence. She says not only will it be ineffective, but it will also be a significant breach of citizens' rights. Ms Turei says ordinary citizens will suffer if the ban goes ahead. But ACT MP David Garrett says the law will make sure intimidating tattoos are covered up. I understand that being in government comes at a price. But it's just getting too expensive for this supporter. Does Three Strikes deter crime? This post is for my peace of mind. I have previously expressed reservations about the Three Strikes Policy shortly going before select committee. The law of unintended consequences is perhaps the one we ignore, at our peril, the most. So I decided, while I have some free time, I would take a closer look. Now I know that if I go looking for studies that discredit the US welfare reforms I can find them. I can also find the converse. So, I expect to find knockers of three strikes and I expect to find fans. # Kovandzic, Tomislav V; John J Sloan III, Lynne M Vieraitis. ""STRIKING OUT" AS CRIME REDUCTION POLICY: THE IMPACT OF "THREE STRIKES" LAWS ON CRIME RATES IN U.S. CITIES. " Justice Quarterly : JQ 21.2 (2004): 207-239. Summarizes several studies showing that homicide rates have declined at a 10-12% slower rate in jurisdictions with 3-Strikes laws. # Marvell, T., Moody, C. (2001). The lethal effects of three strikes law. Journal of Legal Studies, 30 (1): 89-106. Finds that Three Strikes laws have had a minimal impact on reducing the levels of crime and through deterrence or incapacitation but that they are associated with 10%-12% more homicides in the short run and 23%-29% more in the long run in almost all 24 states examined with Three Strikes laws. Our state's three-strikes law, the nation's first, was designed to nail two kinds of criminals: first, the violent predators and, second, those who commit lesser but far more numerous crimes over and over again. But the law's chief benefit is the amount of crime it deters from felons with one or two strikes already on their record. When a third conviction means life behind bars, many legally-challenged citizens resist the temptation to commit that third offense. Of those who don't shape up, many simply move away. This helps explain that while violent crime rates have plummeted nearly 30 percent since "three strikes" became law in 1993, only about 26 felons "strike out" each year. Opponents had predicted nearly four times that number would do so. They assumed that changing the law would not change criminal behavior. They were mistaken. Ask any street cop. Their street-level insights are far more valuable and relevant than those of academics and politicians. So, taking into account population growth, there has been a slight improvement. Slight. Again the rates have dropped slightly but I am not overwhelmed. Same sort of picture. Another three-strike free state, New York, shows a similar pattern. I can't convince myself that the Three Strikes policy will do what I most want it to - deter serious crime. Additionally there appears to be a very real danger that it makes criminals more violent. This morning I came across this graph which clearly shows numbers unemployed dropping from around 135,000 in 1999 to around 80,000 by 2008. 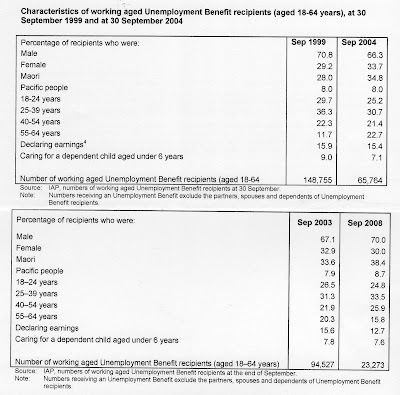 Yet the following tables show that in 1999 148,755 people were receiving the unemployment benefit and the number dropped to 23,273 by 2008. So how are sixty-odd thousand unemployed getting by? 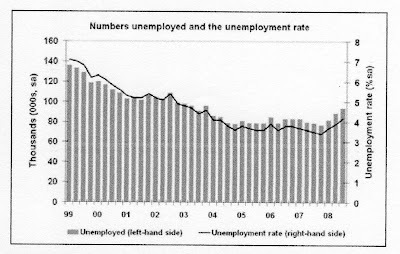 1/ Unemployed people in 2008 are largely short-term unemployed and have no need of or do not qualify for the dole. 2/ Unemployed people in 2008 are relying on other forms of income, perhaps an employed partner. I doubt that 1/ is the sole answer because then you would expect those left on the dole to be long-term employed only and that just isn't the case. 2/ may be right but that would require a cultural change. In September 1999 there were 83,635 people on either a sickness or invalid benefit. By September 2008 the number had climbed to 131,826. 48,000 more. Not far off the number we are looking for. The Labour government constantly denied that unemployed people were moved onto other benefits. Strictly speaking that may be true. But the beneficiary pool is ever-changing; people come and go and have repeated spells on welfare. When coming onto or back onto a benefit, I would suggest fewer and fewer were put onto the dole. MSD data shows that 72 percent of the working aged clients granted a sickness benefit in 2006/2007 had received some sort of benefit in the previous four years. And 69% of people granted an invalid benefit had transferred from another benefit or district. I will repeat how the OECD describes incapacity benefits. They represent the medicalisation of labour market problems. What is worse than one Families Commissioner? Change the Bill of Rights ? "First they came for the criminals, then they came for the Communists, then they came for the trade unionists and then they came for me and there was no-one left to speak ... it's very dangerous to go changing the Bill of Rights for political popularity. " OK. Now I have some thoughts. There is no way the Bill of Rights should be changed despite the fact that it is quite frequently contravened. How the hell will ACT ever again argue for its observance in any given circumstance. Here is a case in point. And remember too that another new ACT MP repeatedly and rightly invoked the NZ Bill of Rights to fight the Electoral Finance Bill. In future opponents can simply reply, "We'll change it." The topic of Tapu Misa's column interests me. My comment however isn't about the topic but her approach. Read through the first four paragraphs and tell me, do fathers have any relevance as parents in her worldview? You can begin to understand the alienation some are feeling. Women today demand men be all things to everybody, but um... some subjects still shut them out? And she won't even be aware of what she has done. Kate Gainsford, head of secondary teachers' union the PPTA, is furious that private schools are turning to the government for help. She says any private schools allowed to integrate will effectively be taking cash from students at state schools. She recently said that schools making such applications are effectively looking for a "bailout for private businesses" and a subsidy for wealthy parents. In fact these 'wealthy' parents are currently subsidising state pupils through the tax they pay that is not used to educate their own. In effect, they are asking to subsidise state school pupils to a lesser degree than they have been. I oppose subsidies for private business when an industry is completely privatised. The NZ education industry is, however, almost monopolised by the state. But this whiner can't get her head around simple economics. If the state refuses to lower the subsidy private school parents pay to the state school system there may be no subsidy at all. In good economic times her gamble may have paid off. Right now, it may not. Private schools are already closing. The more private schools close, the more students will flock to state schools. As long as the education budget remains unchanged there will be less cash for each state student. Exactly what this silly cow is railing against.